My sweet Gram passed away on October 13. I'm sure that nothing I could think to write here would come close to expressing how terribly I miss her, or what an amazing woman she is. I find traces of her in most every aspect of my life. She really influenced me tremendously, and I am so grateful for her stalwart example. Gram passed away one week after her 98th birthday. She was never one that I would refer to as 'old'. That just was not a word that came close to describing her. She was so full of vim, so active and hard working her entire life. She was always actively engaged in some good cause or other. She is so loved by all who know her. My Gram is such a quick witted, funny person. She has the best memory of anyone I've ever known. She could still recite The Fox and the Crow, in French, that she learned more than 80 years ago in school. Her gems of wisdom continually come to mind as I go throughout the day. It has always been that way, I have always greatly admired her. She always loved learning. 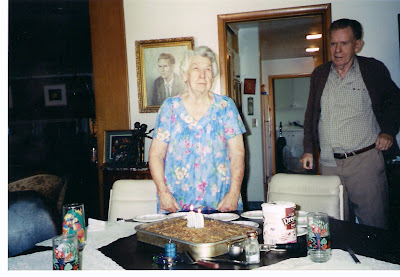 A few nights before she passed away, she had seen a television program about molecular biology and mold and had called up my Mom to warn her that if she ever found mold on a loaf of bread, to throw it out because the whole thing would be contaminated! I loved walking into her home. She was always so happy to see us, and always made us feel like we made her day just by being there. She would tell us stories about her life, the people she loved and knew, and she could remember the names of all involved! She remembered names of neighborhood figures she knew as a child, the grocer, her teachers, her friends and acquaintances. I am amazed by her brilliant mind! I have so many stories I love and charish about her. I couldn't have asked her a better grandmother. In deed, she certainly was, and is, the best grandmother ever. I miss you, Gram. Thank you so much for your post. You said what I felt too inarticulate to share. I see her genuine interest in people and their lives in you. you can check out www.hodsonbromely.blogspot.com for the family blog.